A look at income in Wichita compared to other Midwest cities. How much do Wichitans earn at their jobs, compared to other cities? 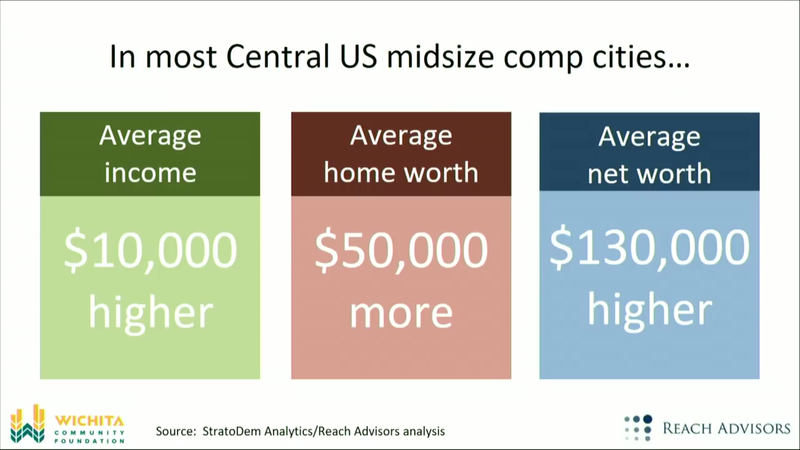 This data is of interest as recently James Chung told an audience that “average income” is $10,000 higher in Midwest comparable cities than in Wichita. He didn’t define the term “income,” he didn’t define the comparable cities, and he didn’t provide any sources of data. But mention of this is a good time to look at income in Wichita and other cities. The Bureau of Labor Statistics, part of the United States Department of Labor, collects data regarding salaries of occupations in different cities in a program called Occupational Employment Statistics. More information about this program may be found here. The OES dataset is large, holding data on over 800 occupations, and it’s unwieldy to make apt comparisons. Besides what I report below, I’ve also created an interactive visualization of the OES data. 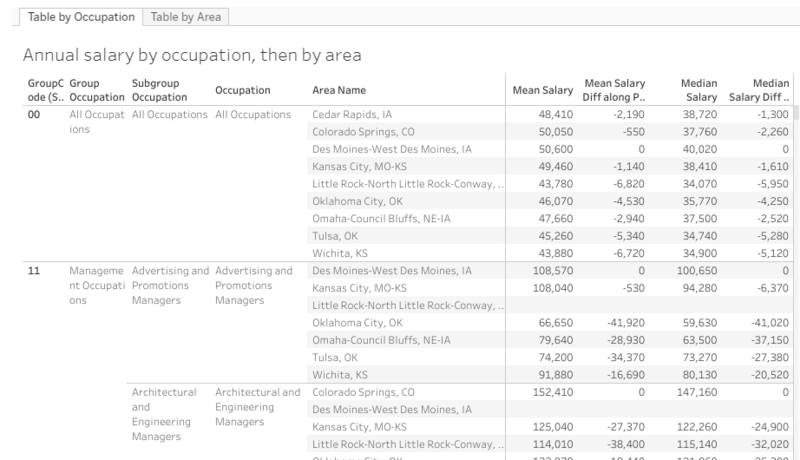 In the interactive visualization, you may select any cities and occupations for comparison. Click here to learn more and use it. Occupational salary example. Click for larger. Considering all occupations for this sampling of cities, the annual salary in Wichita is $43,880, while it is $50,600 in Des Moines. That’s $6,720 lower in Wichita, or 13 percent. Considering a few semi-random occupations: For buyers and purchasing agents, the highest salary is in Cedar Rapids at $75,830. The Wichita salary is $9,640 less, while the Des Moines salary is $15,070 less. For food service managers, the highest salary is in Colorado Springs at $66,300. The Wichita salary is $1,520 less, while the Des Moines salary is $21,270 less. For police officers, the highest salary is in Colorado Springs at $68,980. The Wichita salary is $21,670 less, while the Des Moines salary is $4,310 less. For telemarketers, the highest salary is in Fayetteville at $27,760. The Wichita salary is $1,860 less, while the Des Moines salary is $2,100 less. For the broad category of architecture and engineering occupations, Wichita is the leader in the sample at $82,710. Des Moines is at $71.930, which is $10,780 lower. For the broad category of production workers, Wichita again leads the sample at $44,950, while Des Moines is at $35,190, which is $9,760 lower. Comparing average salaries for groups of occupations in different cities has problems. One is the number of workers in occupations. Considering management occupations, there are few chief executive officers but many other managers. The weight of the number of workers needs to be considered. Also, the magnitude of salaries is an issue. Chief executive officer salaries vary widely, by tens of thousands of dollars. 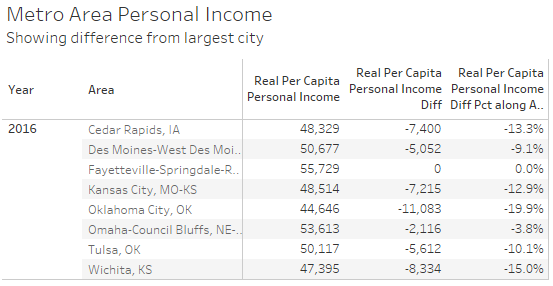 The data tells us that a CEO in Wichita earns $65,400 less than in Des Moines. That variation is greater than the average salary across all occupations, and provides little insight into the salaries of the majority of workers. The per capita personal income figures overcome these obstacles. 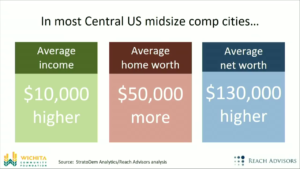 Do Wichitans earn $10,000 less than in comparable Midwest cities, as James Chung recently presented? Based on per capita personal income, the answer is no. Not even close to that, although Wichita’s per capita income is not encouraging. Based on occupational salaries, Wichitans earn less than many comparable Midwest cities, but nothing near $10,000 less when all occupations are considered. In specific occupations, Wichita salaries are much less, but in some cases Wichita salaries are highest.